Over the summer I had the pleasure to be part of the Junior Research Associate scheme and conduct my first own piece of research in the EDGE lab. I got interested in the scheme when I visited the poster exhibition of the previous year’s JRA students and was amazed to see all the exciting and interesting research everyone was conducting. For my project, I wanted to look at resilience and factors which may protect at-risk individuals from potential maladaptive outcomes, such as depression. Depression is a common mental disorder and affects more than 300 million people worldwide, it is linked to increased health care costs and premature mortality. Frequent physical activity has been found to have beneficial and protective effects on mental health both cross-sectionally and over time, such as reduction in anxiety, depression and negative mood. Evidence suggests that physical activity is linked to lower prevalence of depression, is a protective factor against the development of depression and also is an effective form of treatment. Viewed longitudinally, physical activity is associated with lower odds for developing depression. However, we currently do not know whether these beneficial effects are also seen in individuals at-risk for developing depression. I conducted a review of nearly fifty individual longitudinal studies included in a recent meta-analysis (Schuch et al., 2018) on the association between physical activity and depression in order to identify potential factors affecting this relationship. However, none of these studies explored if this association also exists for those at-risk for developing depression. One such at-risk group are individuals who have experienced adverse childhood experiences (ACEs). ACEs have been linked to a variety of maladaptive outcomes, including mental ill-health and appear to be cumulative, meaning the risk of negative outcomes increases with the number of ACEs experienced. Evidence from animal studies suggests that physical activity can ameliorate behavioural and biological markers in animals having experienced early life stress and can enhance resilience against chronic stressors. Using data from the National Survey of Health and Development (NSHD), I performed cross sectional analyses at seven different time points across the lifespan (ages 13, 15, 36, 43, 53, 60-64, and 69) in order to explore the association between physical activity and depression when taking into account type and number of ACEs experienced. For this, I compared low adversity groups with high adversity groups (categorised by number of ACEs experienced) when looking at the effects of different levels of physical activity (below average, average, above average) on depression. I also compared types of adversity experienced, such as socioeconomic (crowding, socioeconomic status) and psychosocial (death of parent, divorce), as these might impact the relationship differently. The results showed a significant main effect of physical activity on depressive symptoms, meaning that individuals with higher levels of physical activity experienced lower levels of depressive symptoms, even when taking into account ACEs. This effect was found for all ages, except age 43. Looking at type of adversity more closely, the positive effects of physical activity on depression was seen for both socio-economic adversity and psychosocial adversity. However, the effect of adversity differed between socio-economic adversity, which showed no significant effect, and psychosocial adversity, which showed a significant effect on depressive symptoms, indicating that individuals having experienced higher levels of ACEs showed higher levels depressive symptoms. At ages 13 and 15, physical activity affected depressive scores for low and high adversity differently. For the high ACE group, depressive symptoms were significantly lower than for the low ACE group when activity levels were low, however, no significant difference was seen when activity levels were average or above average. This result suggests that engaging in physical activity may act as a protective factor for individuals having experienced high psychosocial ACEs and may therefore provide an opportunity for intervention. 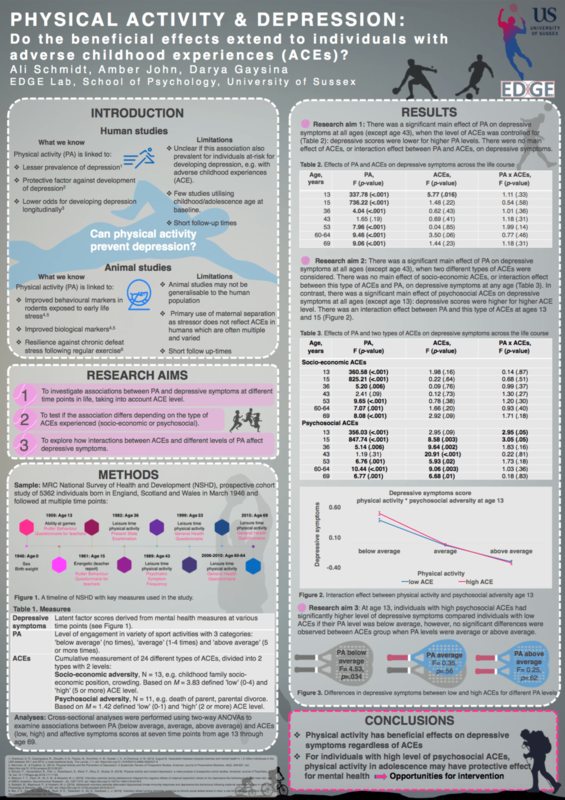 As part of the project, I created an academic poster which was shown during the JRA poster exhibition and I am currently applying to present my findings at a national conference. I really enjoyed my JRA experience and was excited to get a first glimpse of what it’s like to be a researcher. The JRA scheme also offered a range of very useful courses to help with our projects, such as effective literature searches, poster creation and presentation skills. I would like to thank Dr Darya Gaysina and Amber John for all their help and support during my project – I learned so much and look forward to conducting more of my own research! ‹ Grouping by attainment in schools: can psychological interventions help turbo-charge poor students’ performance? 1 Pings/Trackbacks for "My JRA experience at the EDGE Lab"